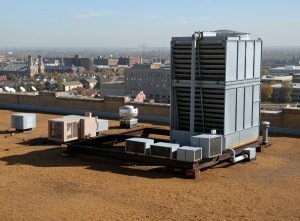 Rooftop air conditioner is a self-contained unit which is usually installed on the rooftop of a commercial building. The type of unit can be for cooling only, heating only or a combination of both. Departmental stores, cinemas and supermarkets are ideal buildings for this type of air conditioning. Installing this unit is economical because it is already factory tested and assembled by the time it arrived at the site. As these units are installed outdoor, they must be designed to withstand tough conditions such as strong gust of winds, rain and direct sunlight. Paint coating used is of suitable grade to withstand these harsh weather conditions. The doors will usually have designed that are able to withstand the wind conditions as well as water from seeping into the housing assemble. When installing, make sure that the rooftop is strong enough to take the weight of the unit. A typical Rooftop Air Conditioner. When choosing a new unit to replace your old unit, look out for energy efficient design based on the SEER. The newer units have better design, some with SEER of greater than 16. Ensure only environmental friendly refrigerant such as R410A is used in the units. Better design units save energy and hence your electricity bills in the long run even though the initial cost may be higher than other less efficient units. Most of the rooftop air conditioner air control system have dampers that are automatically controlled electronicallly. The dampers that are to be controlled are the fresh air intake damper, exhaust damper, return damper and conditioned air damper. There are many sensors that are used to measure the temperatures of the air. The amount of opening of the dampers are depending on the unit settings and feedback of the sensors. Depending on the design of the unit, an off-the-shelf economizer can also be used to control these air flow. The conditioned air is then channeled to the various parts of the building by using the duct distribution system. Diffusers are used to discharged the air into the rooms. Individual thermostats can be used to control the amount of conditioned air that is being discharged to each room. As the rooftop units are usually located on the roof of a building, various precautions have to be taken to ensure that your safety is of utmost importance when doing maintenance or trouble shooting the units. Here are some of them. When the weather is hot with direct sunlight, use gloves when handling heated panels. Panels are usually made of metal and they will be hot when heated under the sun. Get a hat and sun glasses to reduce the loss of fluid from your body due to the heat. Always have a bottle of water to replenish your body fluid after working for a period of time. Under strong wind condition, always ensure that the doors of the panel are securely opened. This is to prevent the wind from swinging the panels which may cause injury to the personnel more so if the personnel is here for the first time. If the wind is strong, consider setting up wind shelter. Safety belts which are securely hooked to the solid part of the units should be used when necessary. Fumes from systems using gas that are emitted from the unit can be hazardous. Hence, avoid breathing the fumes. It is always a good idea not to work alone. Getting a team of people to work on the unit is necessary to prevent any untoward incident. Ladder that is used to climb up the roof must be solid and not flimsy. Use both hands when climbing and ensure another person hold it.